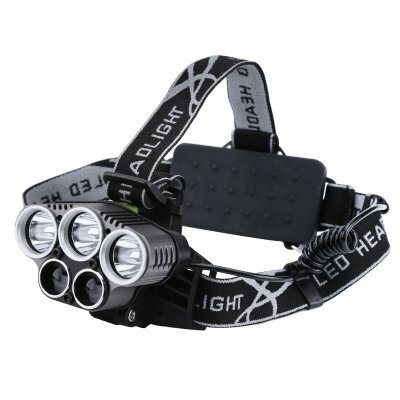 Successfully Added CREE LED Headlight - 5 LED, 2x 18650 Battery, 5 Light Modes, 2x Blue-ray LED, Aluminum Alloy, Adjustable Size And Angle to your Shopping Cart. With this CREE LED headlight, you’ll never be left out in the dark again. This torch is perfect for those of you that often head out after dark. Additionally, it is a great asset to any emergency toolkit. Whether you use it during a nighttime hike, fishing trip, or a power failure at home – this LED headlight will always provide you with the needed light in the dark. It features a durable aluminum design. Thanks to this you’ll be able to use it outdoors without needing to worry about scratching or breaking it. The headband features a soft and comfortable design. Additionally, it can be manually adjusted in size. No matter the shape or size of your head, this headlight fits everybody. Your LED flashlight comes with a total of 5 LED lights. Three of these lights are white whilst 2 are Blue. The bright white lights offer great usability for when you’re out in the dark and need a powerful light source. The blue lights, on the other hand, are great for during hunting and fishing trips. These Blue-ray lights offer you an efficient source of light that won’t spook any animals in the area. The CREE headlight furthermore features 5 different lighting modes. Thanks to this, you can be assured you’ll always have the right amount of light available to meet your current needs. This outdoor gadget is powered by two 18650 batteries (not included). These bring along plenty of power for you to get through the longest of nights. The angle in which you aim your light can be manually adjusted. Thanks to this you’ll be able to aim the light in the exact direction where it is needed. The gadget features a simple design and allows you to switch in between the different lighting modes with the press of a button. Whether you’re out camping, fishing, or use it as an emergency flashlight – this LED light is sure to meet your demands.